The two main characters in the new series from the creators of The Private Eye are both on long journeys that seem like they’re destined for a head-on collision. But the thing they collide with is totally unexpected. 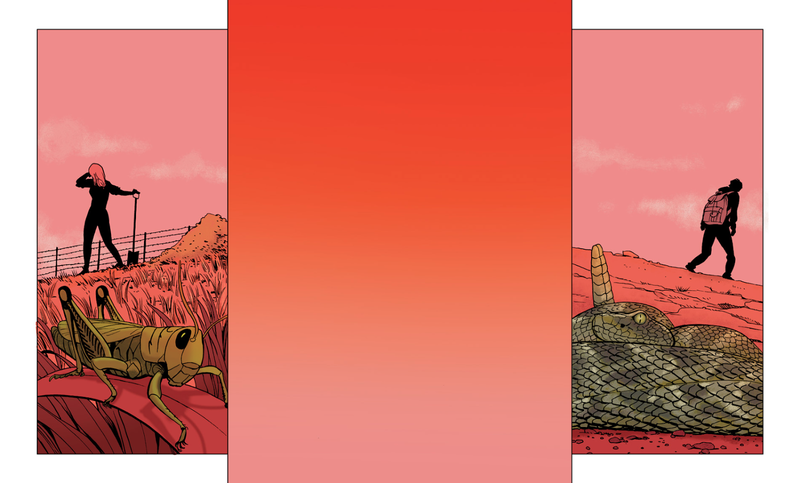 Written by Brian K. Vaughan with art by Marco Martin and Muntsa Vicente, Barrier starts small. The incident that tips the story’s first domino is the offscreen killing and mutilation of a horse belonging to a rancher named Liddy who lives on the border of Mexico. She assumes that narco-thugs are responsible for the grisly corpse and talks to folks from her checkered past to figure out the best way that she can secure her property. While Liddy’s fending off creepy xenophobes, a young Honduran man named Oscar wends his way towards the United States, dealing with his own set of dangers. The pages dedicated to Oscar are entirely in Spanish but one of Barrier’s successes is that you can feel the tension, threat and compassion in these panels without understanding the language. The slower pacing here does a great job of letting readers marinate in Liddy and Oscar’s individual frustrations, skillfully building up tension that you’ll want to see explode. And when that climax does happen, it’s apparent that a different kind of emigration is about to start for both characters. As seen previously in The Private Eye, the composition and colorwork of this particular creative team excels at making mundane facets of everyday life vibrate at higher frequencies. Barrier is being offered a pay-what-you-want release, just like its predecessor from creator-owned publisher Panel Syndicate. The series’ first installment is a great bit of set-up that curious folks probably won’t regret throwing a dollar at. Think of it as a ticket to a place you’ve never been to.